At the 52nd ECOWAS Summit in Abuja, the Ivorian Jean-Claude Brou was appointed as president of the regional organisation’s commission. Born in 1953, Brou holds a master’s degree in economics from the National University of Côte d’Ivoire, an MBA in finance and a PhD in economics from the University of Cincinnati. He began his career in 1982 at the IMF, where he served as country economist in several African countries before being appointed, in 1989, as the resident representative of the institution in Senegal. After this international experience, he returned to Côte d’Ivoire in 1991, where he held senior public positions, first as an economic and financial adviser to Prime Minister Daniel Kablan Duncan, then as president of the privatisation committee, at the head of which he oversaw the privatisation of 70 Ivorian state-owned companies. He later joined the BCEAO, where he held the positions of director of international relations in charge of UEMOA integration policies, director of economic studies and currency, and the special advisor and comptroller general. He was appointed as the representative of the World Bank in Chad in 2010. 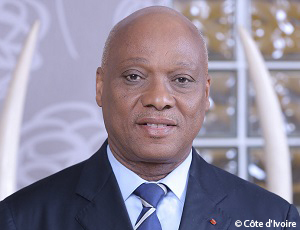 Brou joined the government of President Alassane Ouattara in 2012 as minister of industry and mines, which he held until his appointment as president of the ECOWAS Commission, succeeding the Beninese Marcel Alain de Souza. Brou will take office in March 2018 for a four-year term.